Hey there teens, do you feel like your parents are checking in on whether you’re doing your homework or not too often? Parents, do you feel like your teen isn’t getting their homework done – and are you checking in on them regularly? As an Academic Life Coach, I meet with both my clients (who are often teenagers) weekly and also their parents for checkups. 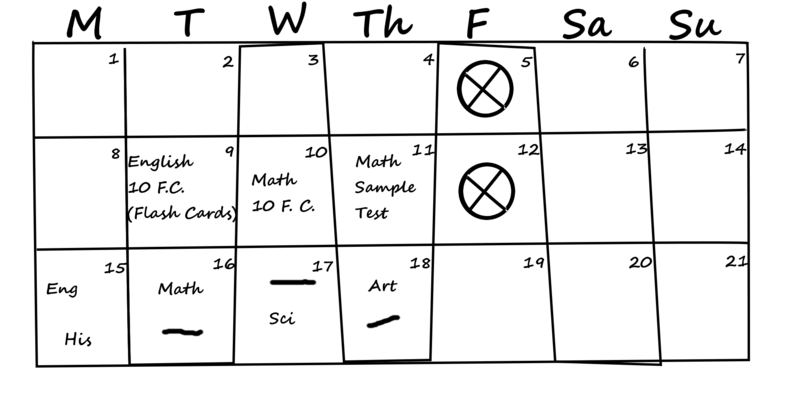 And so I have a client I just had a session with who is finishing up his freshman year in high school, and one of the things we were talking about this week is how often his parents should be checking in on him regarding his homework. This week’s video is for both you parents and teenagers out there, regarding parent’s checking in on their teen’s homework. As teenagers, and we’ve all be there, we start seeking our independence. It’s not unusual that when we hit our mid teens that we start wanting to fend for ourselves, and this includes academically. As I was saying, I have a client, who is just finishing up his freshman year in high school, and he feels that his parents are checking in on his homework way too much. Now, he has ADHD and a bit of a perfectionist, and therefore in his previous years he’s had a history of not getting homework turned in on time or at all. As a result, his parents would regularly check in with him regarding his homework to make sure he was getting it done, and in middle school, this worked great. However, now he’s pushing back against them, and he said something that I felt was very insightful. 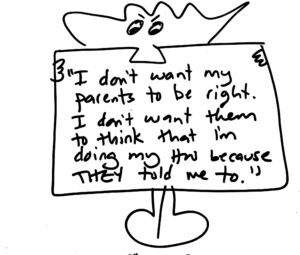 “I don’t want my parents to be right. I don’t want them to think that I’m doing my homework because THEY told me to.” He wanted to be doing it because he knew he needed to for his future. And I can totally relate to this, and I’m sure a LOT of parents out there if you think back to your teenage years you’ll have a similar story to mine. I remember in high school I had an Algebra teacher who told me and reminded me regularly, that I could have an A in his class. My father, who is a mathematician, also was convinced I could have an A, and so they both regularly were checking in on me and pushing me to get an A in that class. As a result, I pushed back, and decided, “No, that’s their goal, I don’t care, and I’m not going to get an A.” Sure enough, I got a B in that class. Similarly, my client says that most of the time when his parents check in on him he’s already doing his homework, but because they check in with him, that makes him feel stubborn and he will often STOP doing his homework because of it. There comes a time when teenagers want to start feeling more independent, and we as parents and guardians need to let them accept the consequences of their actions so that they can learn from it. Now, of course, this advice isn’t applicable to all families, as I don’t know the specifics of your situation and your parent/child dynamics; however, I did think this was a theme worth sharing – that sometimes when we as a family check in too often on our teenagers we are getting in the way of them experiencing their own independence. As always, if you found this tip useful, or if you have any questions feel free to email me at Gretchen@GretchenWegner.com and if you feel you need help with your academics please consider looking at my online course! 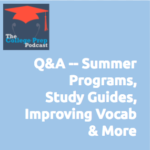 Summer Programs for College Prep: We are looking at the Stanford University “High School Summer College” program for our son. The classes are interesting, and it looks like a good experience. My question is will this help him get into Stanford or other similar schools when he is a senior? When Teachers Give Incomplete Study Guides: What do you do if your teacher doesn’t list some facts/ideas on the study guide but does put those questions on the test? How do you study? Apps for Vocab Improvement: I’m wondering if you know of any apps or programs that would help a high school student develop a deeper understanding of words… I imagine through word study including roots, prefixes, and suffixes. I have some old=school tools but would like to give her something a little more user-friendly for working on at home. Ideas? Singing to Music When Studying: I’ve heard you say that it’s ok to listen to music while studying, but what about if you are singing along with that music? Can you really concentrate and use your full brain if you are singing while doing your homework? What’s Wrong With My College Application? My son is completing his 12th grade and has applied to several good universities. He did his 9th and 10th from a school in India and will graduate from high school in Texas. He scores A*s in all subjects. His current GPA is 4.1. He scored 800 in SAT Math and 760 in English. He plays guitar, is a black belt in Karate and knows multiple languages- English, French, German, Hindi. With all these qualifications he is still not getting selected by Universities. Why? What is missing for him? How can we supplement his existing applications in other universities? Can we appeal? Click here to listen in as Gretchen Wegner and Megan Dorsey answer your questions! 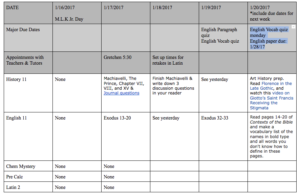 How to Find the Theme of a Book Quickly So You Can Write That Essay Already! 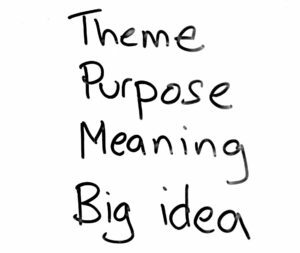 Does your heart sink when you notice that the essay prompt asks you to find the “theme” or the “purpose” of the book you’re reading? Do you often think to yourself, “I have no idea! !” and then BS your way through the essay? Well, I have a hint for you! Of course, the best line of defense is to listen during discussions in class, take good notes, and also talk to your teacher. But if none of that helps, this trick will take you the rest of the way. And who knows, maybe what feels like BS might be pretty smart stuff after all!? I received an email earlier this week from a senior in high school that was having a difficult time with a prompt she received in an AP English class. She needed to find the purpose of a novel so she could write an essay about it. Another way we can look at this is: What is the theme, or meaning, of the novel? So I wanted to give you all a little trick I use with my clients. See when I’m coaching I have very little time to help a student push through work on their essay, so I have to make quick decisions how to help a student find the theme or purpose of a book when I haven’t read it myself. As such I’ve developed a bit of a trick. 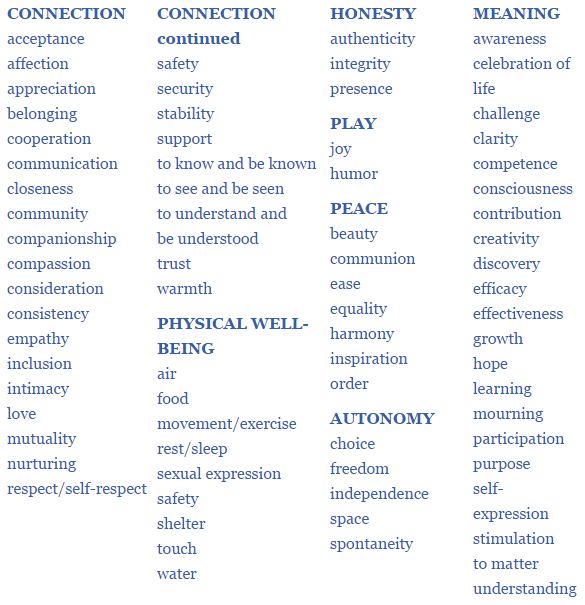 I like to use a list from the Center for NonViolent Communication that’s called the Needs Inventory. What I have found is that it can be really helpful to look over this list with a student and ask, “What are the universal needs that are represented by the characters in this book?” For example, is there a need for order because things are really chaotic, and the characters are trying to create order but it’s really hard. I’ve found that students can pretty easily find 1, 2, or 3 needs that are really active in the book, and then find concrete evidence why those needs are a big deal in the book and how it plays out for the characters. Then you can use this to write an essay about how the theme or purpose of the book was about “insert universal need here”. If you found this tip useful and you’d like more tips for writing essays or understanding the theme or purpose of books, click here! My son is attending a National College Fair coming up in mid-March. Do you have any strategies or ideas for best practices when attending a fair like this? There will be over 180 different colleges there from all over the country, so any suggestions on how to maximize time would be great. Also, we have never attended a fair of this size before — can you give some suggestions for the role of a parent (hang back, listen, stay at the coffee shop?) and also some etiquette/protocol suggestions for the student. 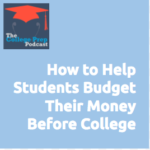 For example, how much time should they spend with a college booth, are their ways to be memorable for a student with a recruiter, if it’s a college they really love, should there be additional strategies to employ and should we leave anything with a recruiter like a resume or business card or is that too much? 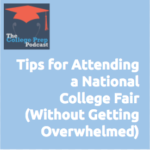 Listen in to Megan and Gretchen discussing how to make the most of a National College Fair visit without getting overwhelmed. Hey there, do you sometimes feel overwhelmed by how much there is to do at school? Does it feel impossible to do it all alone? This is a video I made last summer, but it’s just as relevant as ever. I’ve seen TOO MANY of my clients buckle under the stress of thinking they have to do school by themselves. That your work doesn’t count unless you accomplish it all by yourself. This is a destructive myth! And it’s unrealistic, too. Watch the video to hear more. Hey there, don’t have time to watch the whole video? Don’t worry; I’ve got your back, here’s a summary. She was feeling discouraged that she couldn’t do it alone, but that’s the myth. Think about this: Professors have their undergrads helping them, researchers have their teams, and authors have editors. If the professionals have assistance, why should students feel they must work alone? As I told her, you don’t have to. Don’t fall prey to this destructive myth. You can always ask your professors, or teachers, or parents, or friends for some help. You can revel in the community, and enjoy the help and insight of a team of people rooting for you as the spokesperson for your ideas. Sometimes that’s true! But more often, we discover that they DON’T have their “to do list” as down as they think they do. In this video, I share a story about a client who recently gave me this line, how I handled it, and what he discovered in the process! With the start of the new semester, a client I’ve been working with a couple of years now was telling me how he was sure that this year he didn’t need to get any time management systems going again this year. So I shared some brain facts I have in my Anti-Boring Approach to Powerful Studying and then I asked him, given the facts I shared and how the working memory needs things to be as clean and clear as possible if he’d be up for just practicing a planner to make time visible. So we devised a time tracking sheet that worked for him. His response, I felt, was absolutely amazing. He said, “Before it felt fine, but now it feels better. 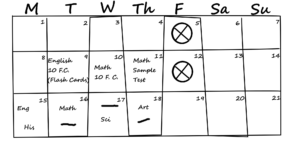 I couldn’t actually tell how much anxiety I was feeling before, but now that we have it all mapped out in that chart, I don’t have to struggle to remember anything anymore and I didn’t realize that was causing me anxiety, but now that I feel better I realize it was.” I thought that was so smart of him, as a junior in high school, to be able to articulate that kind of understanding of his experience. If you want more tips to reduce anxiety or time management, then I have tons of them in the Anti-Boring Approach to Powerful Studying, which you can learn more about by clicking here. Do you ever get a good idea about something you want to do in the future? But you don’t act on it right away, and soon enough you forget the idea… and nothing ever happens? Recently, I was working with a client who had a very good idea about how to make sure he studies well for his next test! Check out the video to find out how he almost sabotaged his good idea… until I made sure he did one little thing that prompted him to follow through. Recently I was working with my client, preparing his study plans for his final exams. He had the idea to study with his friend, which I thought was a wonderful idea. So I asked him, “when are you going to study with her?”, to which he replied, “Oh I don’t know, but I’ll study with her.” He was procrastinating, so I suggest he send her an invitation to study right now. 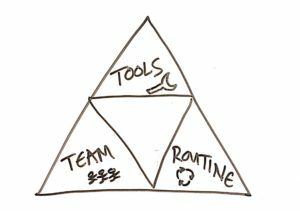 He laughed and agreed, saying, “you got me if I do it now I’m more likely to follow through.” This is a perfect example of how the “team” part of my “Tools, Team, Routine” triangle I teach in the Anti-Boring Approach to Powerful Studying. The “team” part of “Tools, Team, & Routine” is not just him studying with his classmate, but also utilizing me as a source to make sure he doesn’t procrastinate contacting his classmate and setting up the time to study. It’s usually other people’s presence that helps us take action on difficult tasks. I know this is true for me, as I always save my hardest tasks for when I’m working with co-workers. It’s a great help to have someone there to help us not procrastinate. If you’d like to learn more about “Tools, Team, & Routine” or just want other amazing tips on how to follow through on a plan, check out my course here. Junior year it’s time to start compiling your list of colleges. 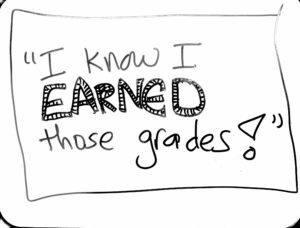 However, how can you tell if your grades are high enough to be considered by the schools on your list? (nice to know) What that school finds important in evaluating applications. Your goal in using this website is to have an honest, fact-based idea about the admissions process at each school, as well as to build a list of colleges that will result in multiple admissions and allow you some choice about where you want to go. Recently, a client’s teacher emailed me to say that in his physics class, this teen seems glassy-eyed and has trouble focusing. When I checked in with my client, a high school senior, he reported that indeed — he has trouble keeping his eyes open in that class. Low energy! We talked it over and realized that the problem is probably what he’s eating for breakfast! Check out what we discovered — and how he fixed the problem. Cereal, whether sugary or not, often leads to sugar crashes, so I told him he needed to get some healthy snacks. This led to a discussion on grocery shopping, as he said his parents weren’t buying him any. As I told him, he’s 17 years old, he can go grocery shopping, he doesn’t need to be relying on his parents for his groceries! I realized that there are 4 key things students, especially high-schoolers, need to be aware of. 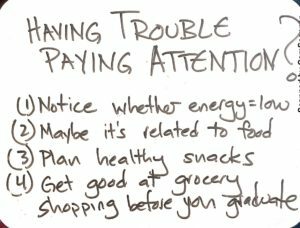 They need to pay attention and be aware of when and why their energy is low. It’s often because of what they are eating, and usually not because the teacher is just too boring. With that in mind, they need to be keeping track of their nutrition, which means going grocery shopping for themselves when they need certain things! I love working with my clients, there’s always something interesting I can help them with. If you are interested in academic coaching or want some awesome Anti-Boring tips and tricks for school, check out my course! Sometimes adults forget that being a student is an emotionally taxing job, that students have fears, and that students often need reassurance! 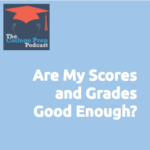 On today’s New Year’s episode we discuss the five ways that feelings get in the way of student success if they’re not acknowledged. 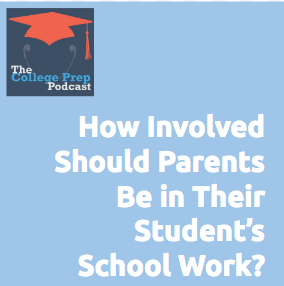 How Involved Should Parents Be In Their Student’s School Work? It’s every parent’s dilemma — how involved is TOO involved to be in your child’s education? On the one hand, you want them to be self-sufficient, and a self-motivated learner. On the other hand, you also want them to be college ready, and are scared that — left to their own devices — they won’t progress fast enough to be college-ready. Gretchen also shares some wisdom from the book How to Raise an Adult: Break Free of the Overparenting Trap and Prepare Your Kid for Success by Julie Lythcott-Haims. 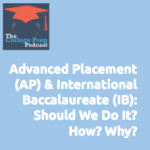 Got any questions or comments about how to apply anything we said in this episode to your situation? Please email us! We love addressing your questions on the podcast (free coaching for you! yes!). 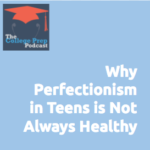 Find us at collegepreppodcast@gmail.com. Do you know a teen in the East Bay who’s ripe and ready to explore their creativity? In a summer writing intensive? For high school credit? I’m thrilled to announce the creative writing course I’m teaching this summer. To learn more, check out this video (created by an enthusiastic student).